Discover the energizing power of raw food: revitalize and rejuvenate with more than 70 inspiring recipes to help kick-start a new, healthier you, including an easy 5-day cleansing detox plan. Have you ever started a new year and vowed to do something about your health? 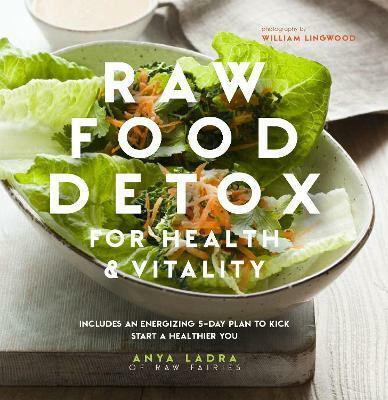 'Raw Food Detox' is here to show you that you can do wonders for your physical and mental wellbeing by following Anya LadraÃ¢â‚¬â„¢s simple recipes. Using only raw and living plant foods, and easy methods of preparation, you can create tasty and sustaining plates of food bursting with energizing enzymes, vitamins and minerals. Start with a 5-Day Cleansing Detox and then be inspired to continue with this innovative way of eating; youÃ¢â‚¬â„¢ll soon feel better than ever! Get the day off to a great start with energy-boosting Juices and Smoothies: choose from Winter Spice Smoothie with Maca Powder, or a refreshing Carrot & Lemon Juice with Omega-3 Oils. Salads and Dressings are full of healthy, creative flavor combinations. Make yourself a Sprouted Buckwheat Salad with Dill Vinaigrette, or clever Parsnip Ã¢â‚¬ËœTabboulehÃ¢â‚¬â„¢ and be satisfied without feeling heavy as you would after your lunchtime sandwich. ThereÃ¢â‚¬â„¢s so much to explore in raw-food Mains Ã¢â‚¬â€œ youÃ¢â‚¬â„¢ll be amazed that you can make delicious Tomato Quiche with Almond Pastry, and Vegetable Ã¢â‚¬ËœSpaghettiÃ¢â‚¬â„¢ with Puttanesca Sauce without cooking anything! For Snacks to keep you going through the day, try Spicy Almonds, or Italian Flaxseed Crackers Ã¢â‚¬â€œ made with a dehydrator Ã¢â‚¬â€œ and Mushroom Pate. And finally, everyone craves Sweets and Desserts, especially when theyÃ¢â‚¬â„¢re on a diet, so enjoy your homemade raw Brownies and Berry Tartlets.